An unoccupied communal cellblock is seen last month at Camp VI, a prison used to house detainees at the US Naval Base at Guantanamo Bay. 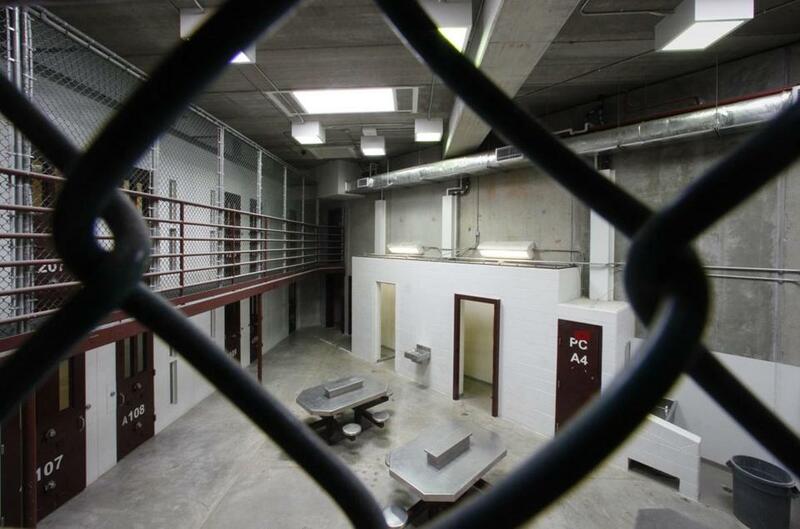 The hunger strike at Guantanamo Bay, which began in February, shows no sign of abating. Indeed, defense lawyers say more than 100 of the facility’s 166 detainees have joined in. The strike was triggered when guards searched copies of the Koran for contraband. But the protest is also one of the few methods that detainees — many of whom have been cleared for release, but are being held because of a lack of stability in their home nations — have to remind the world that they still exist. The farther we get away from Sept. 11, 2001, the harder it is to justify this facility. The hunger strike should remind President Obama of his unkept promise to close it. Detainees imprisoned for more than a decade had high hopes of being released, or at least put on trial, when Obama took office. But only a handful of trials have moved forward, at a glacial pace. Transfers out of the facility have ground to a halt. That’s why Obama ultimately deserves the blame for the failure to make more progress at closing Guantanamo. He seems unwilling to tolerate any risk at all. Even Shaker Aamer, a British resident cleared for release years ago, remains at Guantanamo, despite the British government’s public and repeated requests that he be sent home. Obama should muster the political courage to stand up to Congress on Guantanamo. If his secretary of defense is unable to certify a transfer under the tough provisions, Obama retains the ability to transfer prisoners with a “national security waiver” — a power he has never used. Obama himself has made transfers more difficult. After one terrorist plot, he issued a blanket moratorium on sending detainees to Yemen, where more than half of the detainees are from. It may be time for that moratorium to be lifted. A new, democratically elected government in Yemen is putting together a plan to take responsibility for its detainees. About a third of the 88 men from Yemen have already been cleared for release. Keeping them at Guantanamo just because of their nationality flies in the face of justice. The US government should support the democratic transition in Yemen by providing the financial, military, and intelligence support necessary to send them home and keep an eye on them. Instead, Obama appears to have thrown in the towel on Guantanamo. In January, he closed the office of the envoy who led the effort to close the facility. Now, the US military is investing in a fiber optic cable to the base and planning for specialized medical care for “aging detainees.” That suggests that some will be held there for the rest of their natural lives. Even Republicans can understand that keeping Guantanamo open — at a cost of $800,000 per prisoner per year, compared with $35,000 in a federal prison — is not in our national interest. Every day it remains open is a drain on our resources and a challenge to our reputation around the world.